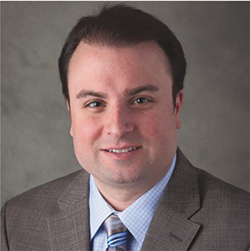 Aaron Wiegel is president, Wiegel Tool Works, Inc., a precision stamper specializing in electrical automotive tight-tolerance terminals, complex lead frames and busbars; www.wiegeltoolworks.com. Personally, I see this from an entirely different perspective, and here’s why. My family owns a metal-stamping company located just outside of Chicago. We’ve been in business for three generations, since 1941, and like many others in our industry we are struggling. 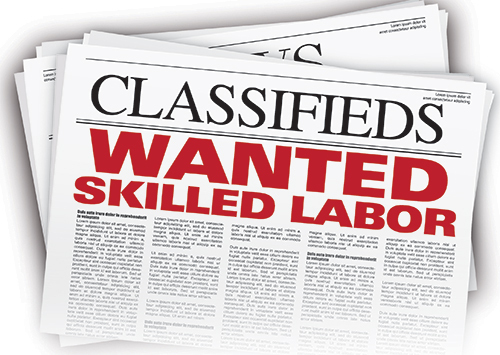 However, we are not struggling to find customers; we are struggling to find skilled workers to fill job opportunities —positions such as tool and diemakers, designers, quality technicians and press operators. Filling current job openings with this degree of qualification is not easy. However, I know that when candidates entering the workforce choose careers in manufacturing, we can provide them with the financial backing to have excellent lifestyles. This is not something that is widely known by the general public or by those entering the workforce. For a time in the 2000s, it was scary to be in manufacturing. With occurrences like 9/11, the emergence of China as a large manufacturing nation and the great recession of 2008, U.S. manufacturing surely was on the decline. Today’s landscape is much different, however. The economy has stabilized and many sectors, including automotive, have recovered. Most importantly, for suppliers like us, large OEMs are finding out that cheaper is not always better. These companies have begun to source their manufacturing locally, bringing manufacturing jobs back to the United States. As demand for manufacturing in the United States grows, so does job creation. Basic economics will tell you that if demand outweighs supply, the value of the current supply will increase. We are seeing manufacturing jobs created without skilled labor to support the growth, and the skilled labor that does exist has experienced a sizable increase in compensation. Further, referencing the letter to the editor again, I respectfully disagree that manufacturing does not offer career paths. Manufacturing creates wealth, and supplies value-added goods and services to markets throughout the world. Yet, as an industry we have done a horrendous job promoting careers in manufacturing. We have allowed people to hold a negative perception of careers in manufacturing, instead of dispelling myths by sharing truths. With today’s global standards and expectations, we no longer are a “dirty, grungy, oily” operation. Manufacturers have adopted lean and 5S principals, strived to achieve zero defects, and instilled continuous improvement in their culture, all while keeping safety the number-one priority. Manufacturing companies also work with advanced technologies such as robotics and automated equipment that require highly skilled operators. In return, these employees now have secure careers. How then do we change the perception of manufacturing careers? Here are some ideas. Network—Getting proactively involved in communities, schools and trade associations such as PMA, and similar local organizations, is the place to start. Not only am I the president of Wiegel Tool Works (WTW) and vice chairman of the Technology & Manufacturing Association (TMA), I also serve on the TMA Education Foundation, which works to promote careers in manufacturing in local high schools and colleges. Together we brainstorm ideas and form committees to help resolve the issues we all face. Networking events and committees are vital to our overall success in manufacturing in our local areas. The TMA Education Foundation, founded 25 years ago, connects businesses with high schools and colleges to promote manufacturing careers. We generate funding and create pathways to careers in manufacturing. The foundation also has contributed to our local training center, providing funding for manufacturing equipment including CNC machining centers and lathes. 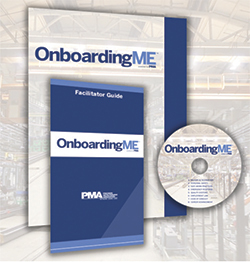 The Precision Metalforming Association (PMA) has launched OnboardingME (Onboarding Metalforming Employees), a DVD video-training program for use by HR managers and others as a first-day-on-the-job orientation resource for new hires and temporary workers. The program presents a set of coordinated policies, practices and procedures that assist new employees in understanding and adjusting to their new jobs in terms of responsibility, compliance, expectations and socialization. It provides a welcoming sense of belonging and highlights critical behaviors and practices that will maximize new-hire retention, provide safe access to the shop floor and expedite the path to high productivity. Contact PMA, 216/901-8800, www.pma.org/onboardingme, to purchase a copy. I strongly encourage readers of this magazine to get involved in these types of organizations. If such organizations are not available in your area, help to form them. Recruit—Recruiting is key to maintaining a healthy balance of employees within our businesses. Since we face a crisis in skilled-labor supply, it is important that we become more involved in recruiting through our local schools. I have donated to local scholarship funds for my alma mater, Northern Illinois University, the TMA Education Foundation and Harper College to promote careers in manufacturing. Through these programs, we can bring students in for internships so that they can gain hands-on experience and consider career options. I also have given presentations to local business leaders and graduating classes, and have hosted open houses to provide students, parents, instructors and guidance counselors an opportunity to view world-class manufacturing and help recruit our future employees. Train—While challenging, training is critical to maintaining a consistent flow of skilled labor. No matter what size the company, a robust, certified training program is essential, not only for consistency but for attracting new applicants. The fundamental push for today’s graduating high-school students is to head straight for college. This may be appropriate for some, but not for all. In 2011, WTW established a U.S. Department of Labor-certified apprenticeship-training program for tool and die making. With TMA’s help, we established a training program that comprises 10,000 hr. of learning. At the end of the program, apprentices become journeyman tool and die makers and are provided with certificates of completion from the Department of Labor. This recruiting tool attracts a lot of talent to WTW. Look around your plant and analyze your workforce. I bet you’ll observe that 40 to 50 percent of your highly skilled labor force is part of the baby-boom generation, projected to retire in the next 4 to 7 years. If we don’t look ahead and address this threat to our industry, we are doomed. We must educate the marketplace on the opportunities that careers in manufacturing can provide to the next generation entering the workforce. Manufacturing is alive and well, but a crisis looms. My advice: Visit with high schools and local colleges, and sell manufacturing. Open your plants to students, parents, teachers and guidance counselors, and educate them on what manufacturing is all about.